Cruising through the neighborhood the other day, I saw this startling sight. The shadow of a huge boxer. Or maybe a Great Dane. Or maybe even a giant cat. 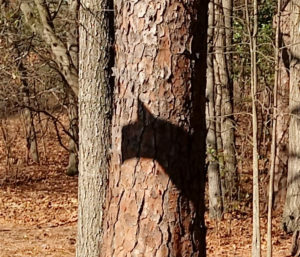 What in the world was making that shadow? I stopped the car (yes I did) and looked carefully around. There was absolutely nothing that could have made that shadow. Not even the friendly neighborhood dinosaur. It’s also a mystery why I even stopped to investigate. But that’s the kind of thing I do.